Comet ISON has an outburst! It could be that the comet is now simply finally “turning on”. After all, it is now only 0.66AU (61,000,000mi, 99,000,000km) from the sun, and if it is to reach the [brightness] at perihelion we’ve always thought it would, then it needs to start brightening by an order or two magnitudes within the next week. So this could be really great news, and indicate that we are indeed going to have a nice bright comet in our solar spacecraft images in a couple of weeks time! 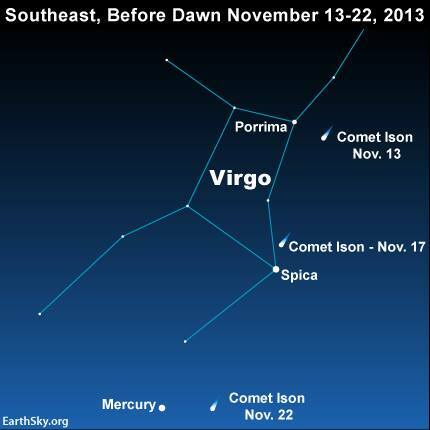 Look before dawn for Comet ISON. 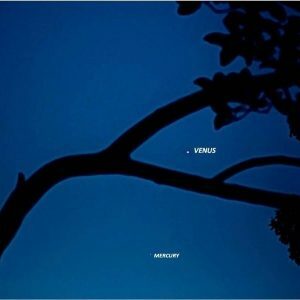 It’s near the bright star Spica now. 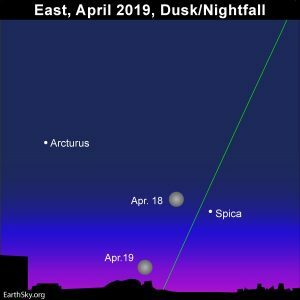 Click here to know Spica’s rising time in your sky. 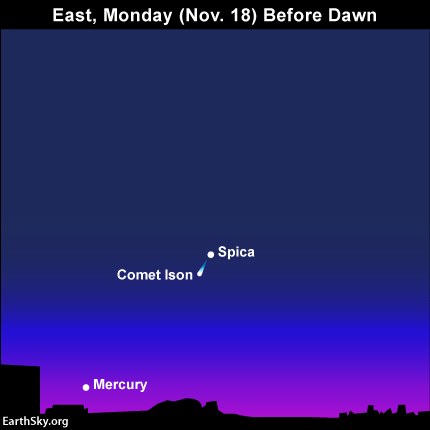 Comet ISON will share the same binocular field with the bright star Spica on the mornings of November 17 and 18. This is the view for the 18th. Look east before dawn. View larger. 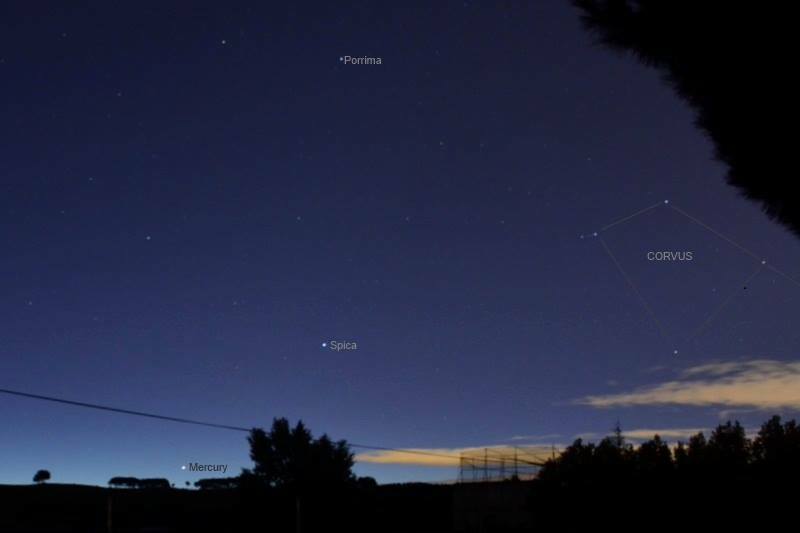 | Here’s the same part of the sky as on the chart above – as photographed on November 13, 2013 by Annie Lewis in Madrid, Spain. This photo looks east before dawn. 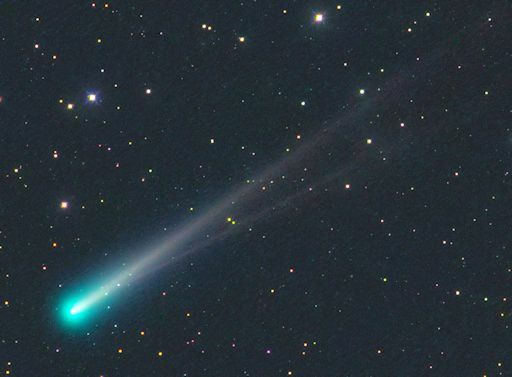 It’s the part of the sky in which you’ll find Comet ISON. Scientists are asking if Comet ISON’s outburst indicates a trend leading to a nice visible comet in our night skies, or if the comet is merely flaring up and afterwards will get fainter again. One possibility, they say, is that Comet ISON’s nucleus, or core, might have fragmented. Or a large fracture might have opened up in the surface of the nucleus, leading to an outpouring of volatile materials, thus increasing the comet’s brightness. … the comet will likely brighten very rapidly over the next few days with a increasingly large dusty coma surrounding it and then begin to fade. Quite possibly it would simply fade out altogether in this situation, though some comets do outburst and then return to more normal levels. … we have no idea what ISON is doing right now, or what it will do in the next couple of weeks! We simply urge everyone who can to get out and observe it while they can. The comet is headed into the morning twilight now, as it hurtles toward its November 28 perihelion, or closest point to the sun. Morning twilight is beginning to interfere with observations of Comet ISON, so if you’re going to search with binoculars … do it soon! Check out the chart – and the photo – above. Both face east before dawn. Scan with binoculars in this part of the sky. Michael Jager of Jauerling, Austria captured this image of the comet on November 10, 2013. It clearly shows that the comet, as it has approached the sun, has two tails: an ion tail (composed of ionized gas molecules) and a dust tail (created by bits of dirt that have come off the comet’s nucleus). Used with permission. Bottom line: On November 13 and 14, 2013, observers are reporting an outburst in brightness from Comet ISON. The comet has been visible for binoculars for some days. It is now said to be at the threshold of visibility to the eye alone.